TH E M R EP O RT | 61 SECONDARY MARKET THE LATEST O R I G I NAT I O N S E R V I C I N G DATA G O V E R N M E N T S E C O N DA R Y M A R K E T Fannie Reports Large Drop in Income in Q1 The GSE reported $2.8 billion in net income in Q1, compared to $5 billion in Q4 2016. F annie Mae reported $2.8 billion both net and comprehensive income for the first quarter, the exact amount of the dividend amount it expected to pay the Treasury Department in June, according to a quarterly report released in May. But that income for the quarter was nearly half what the GSE reported in Q 4 of 2016. In January, Fannie reported $5 billion in Q 4 net income. The GSE attributed the de - crease to significant- ly smaller increases in interest rates in the first quarter of 2017 as compared those in Q 4. "Large increases in longer-term interest rates in the fourth quarter of 2016 resulted in substantial fair value gains on the company's risk man - agement derivatives for the quarter, as well as credit-related expenses that partially offset these gains," the report stated. "By contrast, interest rates increased only slightly in the first quarter of 2017, and therefore did not have a substantial impact on the fair value of the company's risk management derivatives or its credit-related income for the quarter." Net interest income for the quarter was $5.3 billion, compared with $5.8 billion for the fourth quarter of 2016. Fannie attributed the drop to lower amortization in - come from mortgage prepayments as a result of "lower refinance activity and lower interest income due to a decline in the average balance of the company's retained mortgage portfolio as the company continued to reduce this portfolio." Net revenues—net inter - est income and fee and other income—were $5.6 billion in Q1, compared with $6.2 billion in Q 4 of 2016. These net revenues came primarily from the guarantee fees Fannie receives for managing the credit risk on loans underlying MBSs held by third parties and the difference between interest in - come earned on the assets in its retained mortgage portfolio and the interest expense associated with the debt that funds those assets. Once June's $2.8 billion dividend is paid, Fannie will have paid a total of $162.7 billion in dividends to Treasury. Despite the near halving of net income, Fannie Mae President and CEO Timothy Mayopoulos said in a statement that things aren't as bad as they appear in the Q1 report. "Both the market and our op - erations continued to strengthen, and our progress was reflected in another profitable quarter," Mayopoulos said. "We look for - ward to advancing our vision to create a digital mortgage process, and make new strides in our ef- forts to encourage the creation of affordable multifamily housing." "We look forward to advancing our vision to create a digital mortgage process." 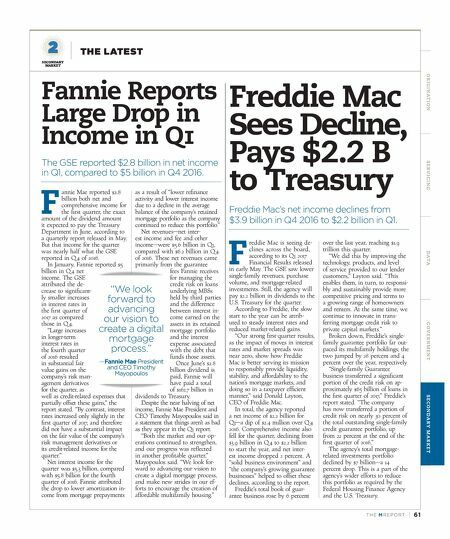 —Fannie Mae President and CEO Timothy Mayopoulos Freddie Mac Sees Decline, Pays $2.2 B to Treasury Freddie Mac's net income declines from $3.9 billion in Q4 2016 to $2.2 billion in Q1. F reddie Mac is seeing de- clines across the board, according to its Q1 2017 Financial Results released in early May. 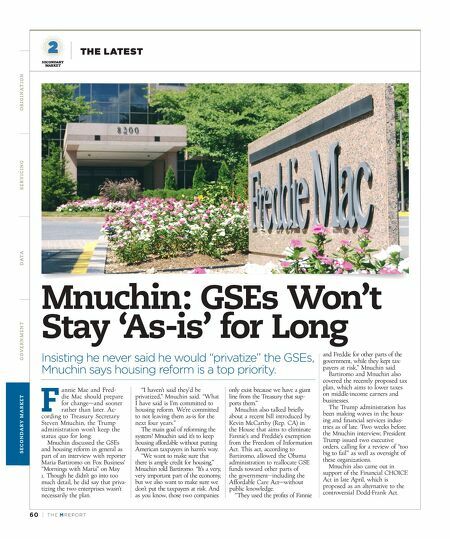 The GSE saw lower single-family revenues, purchase volume, and mortgage-related investments. Still, the agency will pay $2.2 billion in dividends to the U.S. Treasury for the quarter. According to Freddie, the slow start to the year can be attrib - uted to steady interest rates and reduced market-related gains. "Our strong first-quarter results, as the impact of moves in interest rates and market spreads was near zero, show how Freddie Mac is better serving its mission to responsibly provide liquidity, stability, and affordability to the nation's mortgage markets, and doing so in a taxpayer efficient manner," said Donald Layton, CEO of Freddie Mac. In total, the agency reported a net income of $2.2 billion for Q1—a dip of $2.4 million over Q 4 2016. Comprehensive income also fell for the quarter, declining from $3.9 billion in Q 4 to $2.2 billion to start the year, and net inter - est income dropped 2 percent. A "solid business environment" and "the company's growing guarantee businesses" helped to offset these declines, according to the report. Freddie's total book of guar - antee business rose by 6 percent over the last year, reaching $1.9 trillion this quarter. "We did this by improving the technology, products, and level of service provided to our lender customers," Layton said. "This enables them, in turn, to responsi - bly and sustainably provide more competitive pricing and terms to a growing range of homeowners and renters. At the same time, we continue to innovate in trans- ferring mortgage credit risk to private capital markets." Broken down, Freddie's single- family guarantee portfolio far out- paced its multifamily holdings; the two jumped by 28 percent and 4 percent over the year, respectively. "Single-family Guarantee business transferred a significant portion of the credit risk on ap - proximately $65 billion of loans in the first quarter of 2017," Freddie's report stated. "The company has now transferred a portion of credit risk on nearly 30 percent of the total outstanding single-family credit guarantee portfolio, up from 22 percent at the end of the first quarter of 2016." The agency's total mortgage- related investments portfolio declined by $7 billion—a 14 percent drop. This is a part of the agency's wider efforts to reduce this portfolio as required by the Federal Housing Finance Agency and the U.S. Treasury.